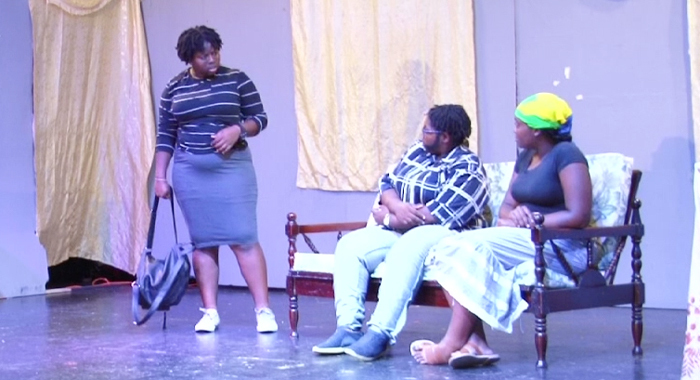 A scene from Bishop’s College’s winning play, “My Brother And I”. The Bishop’s College are winners of the 2018 Secondary School’s Drama Festival after defeating six other secondary schools with their play “My Brother And I” written by Ron Jackson. The school also copped the Best Original Play, Best Director, Best Make-Up And Best Stage Management awards. Tameisha Williams and Ashely Dennie, both of the Bishop’s College, took the Supporting Actress and Best Actress Awards. Second place went to the Intermediate High School with their play, “Don’t Blame The Devil.” The school also took the awards for Best Costume, Best-Set Design and the Best Actor award, captured by Brandon Collins. 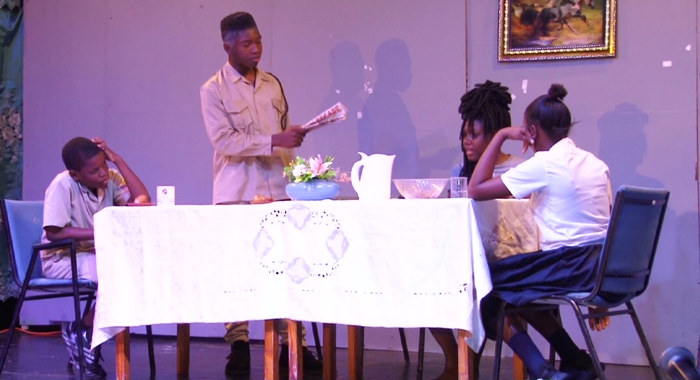 Third position went to the J.P. Eustace Secondary School with Lesron Stuart, taking the Best Supporting Actor award. At the closing event, Drama Development Officer, Martin Quashie encouraged more secondary schools to participate in the drama festival, saying there are many benefits to be derived from their participation. Cultural Officer, Anthony Theobalds thanked all the schools involved and extended his appreciation to the parents for the facilitation of this developmental process. Education Officer within the Ministry of Education, Dexter Bacchus, congratulated all the teachers, students and parents for their contribution to the festival. The judges for this year’s festival were actor, writer and barrister at law Ronnie Marks, actor, dancer and taxi driver, Angus Martin and writer, director, poet and Barrister at law, Duane Daniel, who was the chief judge. Daniel urged schools to make use of the opportunities to be had from theatre arts. On the heels of the festival, the Ministry of Culture will be having a play-writing workshop in January 2019.